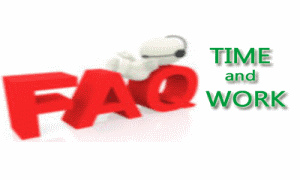 Here are some of the frequent and different questions asked in Time and Work are given. A in some days ,B in some days then(A+B)=?.A, B, C separately finish work in some days then(A+B+C)=? (AB)together,A alone finish work in some days then B alone? 2. A and B together complete a piece of work in 4 days.If A alone can complete the same work in 12 days,in how many days can B alone complete that work? (AB)together ,(BC)together,(ABC)together finish work in some days, then (AC)together in? 3.A and B can do awork in 8 days,B and C can do the same work in 12 days .A,B and C together can finish it in 6 days.A and C together will do it in? Also,A (or)B(or)C alone will do it in how many days? 4.A is 30% more efficient than B.How much time will they ,working together ,take to complete a job which A alone could have done in23 days? 5. A can finish a work in 18 days and B can do the same work in 15 days.B worked for 10 days and left the job.In how many days,A alone can finish the remaining work? Problems on group persons: How many persons needed to finish the work? 6. Twenty four men can complete a work in sixteen days.Thirty two women can complete the same work in twenty four days. Sixteen men and sixteen women started working and worked for twelve days.How many more men are to be added to complete the remaining work in 2 days?